Fitting shed guttering to metal or plastic sheds has never been easier than with Hall’s Rainsaver guttering brackets. Worried about voiding your metal or plastic shed warranty? 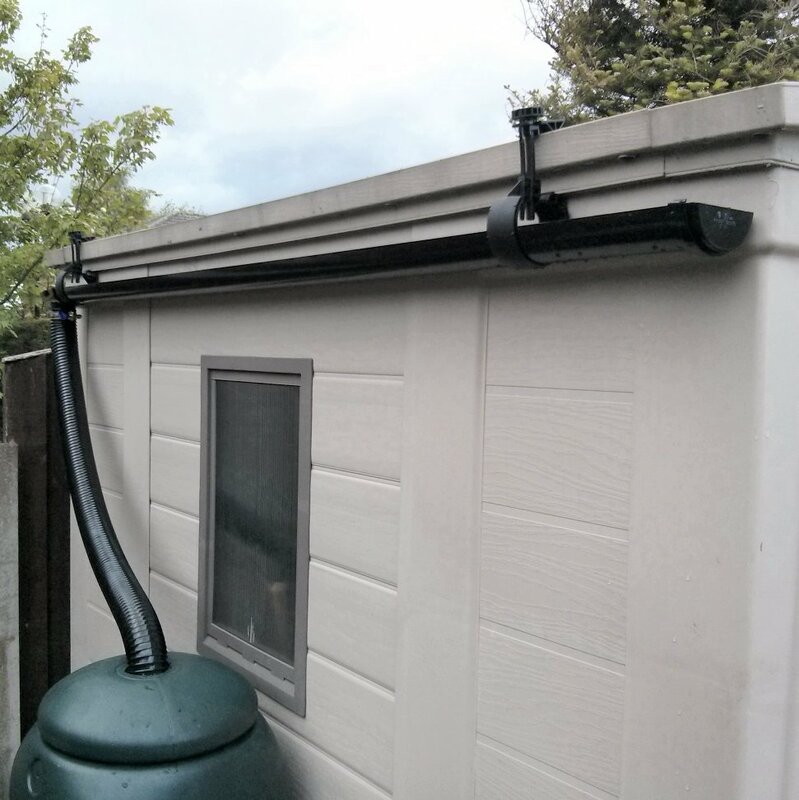 There are many customers with metal shed guttering from Hall’s Rainsaver. Likewise customers prefer to fit our guttering to keter plastic sheds as no screws or drill holes are necessary, therefore avoiding warranty problems. 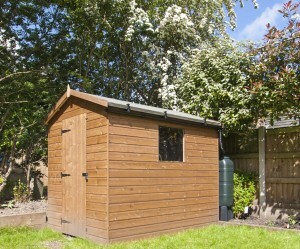 Is shed guttering easy to fit on metal and plastic sheds? Fitting our brackets to metal or plastic sheds is simple. The bracket clamps onto the edge, without tools, although often if the edge is very thin, some packing material may be necessary. Similarly if the surface is very slick/shiny then use some grip material (like anti-slip matting often used on car dashboards and kitchen surfaces). 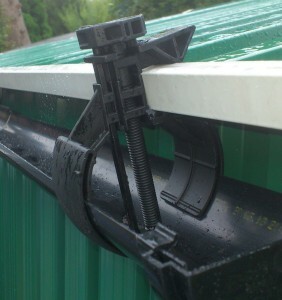 This works well to enable the guttering brackets clamp to the edge without sliding off. 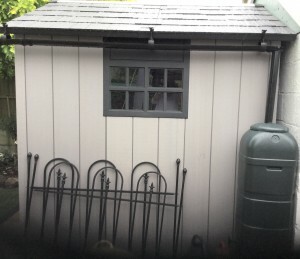 The above photos show keter sheds and a metal shed with our gutter brackets installed. In these cases there were also some lips available to help grip to, although we have also had customers successfully make use of anti-slip material where needed. For those preferring to get their own guttering and fittings, any standard 75/76mm (3″ mini) half round guttering can be used with our guttering brackets. There are two sizes of flexible pipe to fit either our Rainsaver kits (using 57mm flex pipe) or there’s the 51mm flexible pipe that fits the often narrower 50mm outside diameter pipes sold at the big DIY outlets. So whether you have a new or old metal or plastic shed, it’s not generally hard to fit guttering to it, and save water for the garden where it is needed! Why wait, fit it now! Spring is coming! Time to think about the shed – and the shed guttering! Posted on March 12, 2019 by Hall's Rainsaver / Posted in Mutterings | Comments Off on Spring is coming! Time to think about the shed – and the shed guttering! Spring is nearly here, and with it comes the nicer weather that makes us all feel good and get out there in the garden or allotment. 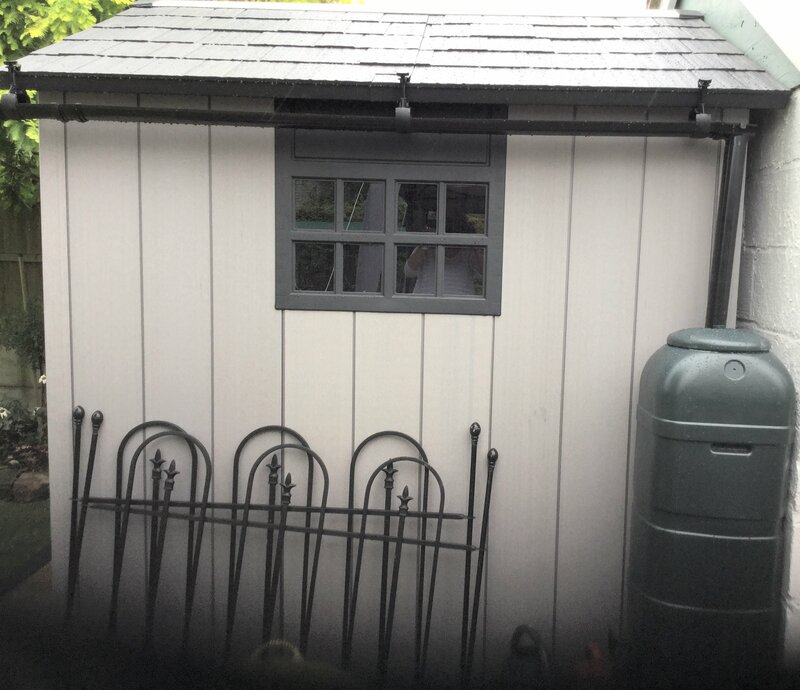 If you have a shed or thinking of getting a new shed, why not get some shed guttering to protect that investment and save water at the same time! Our shed guttering kits are ideal as they are not only ridiculously easy to fit but also are moveable, which makes the job of painting or protecting your shed much easier too! Most other shed gutter kits are labour intensive and often possibly not including everything you need depending on the length of overhang and roof angles involved. We’ve been told more than once that it takes longer to get a Hall’s Rainsaver Guttering Kit out of the packaging than it does to install! Click here for our online shop to take a look! Our guttering brackets fit all standard 3″ (75/76mm) half round guttering so if you are more DIY minded and fancy saving a bit on the postage cost by all means you can still buy our brackets separately to go with your locally sourced guttering components if you prefer. If you want to visit us (by appointment only please) the postcode WA13 9BX gets you closer (the entrance is almost opposite Warrington Road (signs for Statham Lodge), adjacant to ADS Skips. To assist with the move, and also due to the much reduced volumes during the colder months, we are also trialling opening on a reduced schedule, closed Mondays and Fridays, from 1st November through to end of February. We hope this doesn’t cause too much inconvenience, if there are any concerns please do get in touch (email is best outside of hours). In terms of any delivery times, orders can be placed up to 12pm Wednesday 21st December for delivery before Christmas, and Wednesday 28th December for delivery before New Year. Please note that in order to take a break we will be closed for business and unable to process orders from 12th to 29th September inclusive. The last day of despatch is for orders received by 12pm on Weds 7th September (in order to cover any potential delivery issues for remainder of the week). Orders can still be placed but those received between then and 29th September will be dealt with on our return on 30th September 2016. We hope this doesn’t cause too much inconvenience and as always thank you very much for your custom. Wishing all our customers a very Merry Christmas and a Happy New Year! We hope that you have a wonderful Christmas and a very happy and prosperous 2016! Our cut-off time is 12pm for all orders for same-day despatch, normally delivered next working day, with the exceptions below for the Christmas holiday period. For Kits and large items requiring courier, the last time to order for delivery before Christmas is 12pm on 22nd December. Orders received by 12pm on 30th December will be delivered by Monday 4th January 2016. Please note UPS are not collecting any orders from us on 31st December so orders received after 12pm on 30th December will be collected from us on 4th January 2016 for scheduled delivery 5th January. NB Smaller orders, sent out via Royal Mail will likely take longer during the Christmas period. A number of customers have requested a way to order larger length flexible kits. We haven’t done this simply because it creates far too many products and confusion in the systems; additionally the way we package up the kits means it is difficult to achieve – the longer pipes won’t fit inside the guttering kit and therefore require separate packaging. However for any customer requiring a longer downpipe kit, the easiest answer is simply to have a coupon code to remove the 1m flexible pipe component of the kit during checkout. Add the kit and flexible pipe lengths required to your shopping cart, e.g. and then at the checkout page, enter coupon code KITWITHOUTFLEX1, and it will remove and discount the cost of the 1m flexible pipe from the order. If you are buying two kits, use code KITWITHOUTFLEX2. For any more than 2 kits, please give us a call! Unfortunately with the current system this also means you can’t use another discount at the same time.